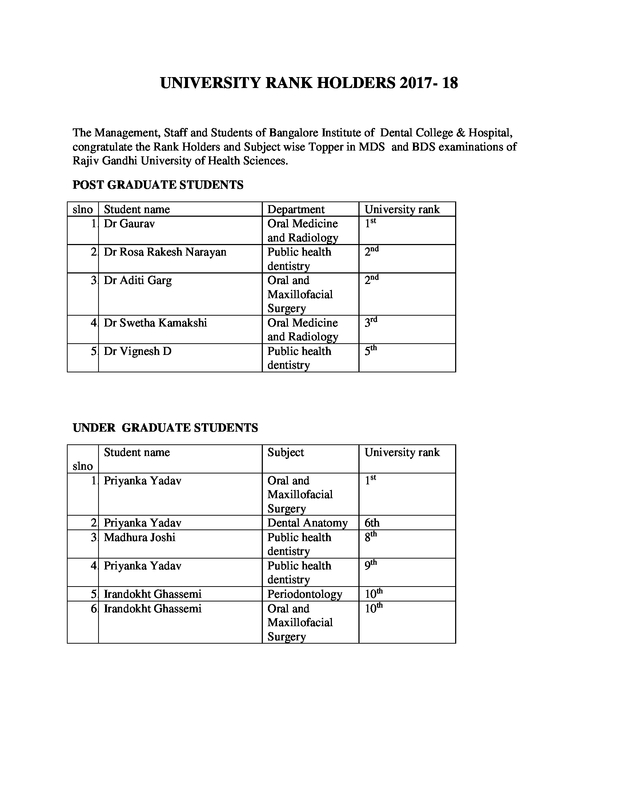 The Management, Staff and Students of Bangalore Institute of Dental College & Hospital, congratulate the Rank Holders and Subject wise Topper in MDS and BDS examinations of Rajiv Gandhi University of Health Sciences. 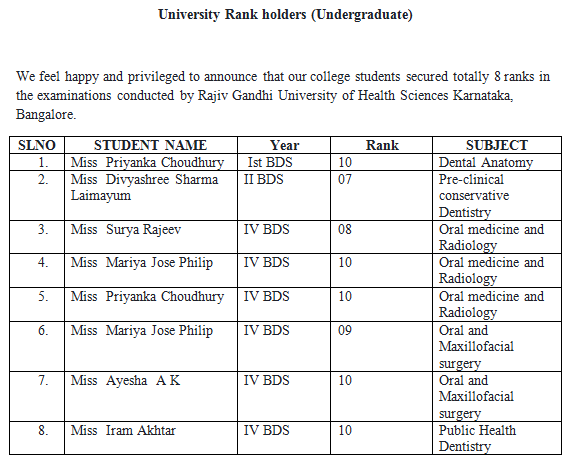 We feel happy and privileged to announce that our college students secured totally 8 ranks in the examinations conducted by Rajiv Gandhi University of Health Sciences Karnataka , Bangalore. SLNO	STUDENT NAME	Year Rank SUBJECT 1. Miss Priyanka choudhury Ist BDS	10	Dental Anatomy 2. Miss Divyashree Sharma Laimayum	II BDS	07	Pre clinical conservative Dentistry 3. Miss Surya Rajeev	IV BDS	08	Oral medicine and Radiology 4. Miss Mariya Jose Philip	IV BDS	10	Oral medicine and Radiology 5. Miss Priyanka choudhury	IV BDS	10	Oral medicine and Radiology 6. Miss Mariya Jose Philip	IV BDS	09	Oral and Maxillofacial surgery 7. Miss Ayesha A K	IV BDS	10	Oral and Maxillofacial surgery 8. Miss Iram Akhtar	IV BDS	10	Public Health Dentistry The management joins hands with Principal, faculty and students in extending very warm wishes. The Management, Principal, Staff and students congratulate Dr Kotecha Ankita Kiritkumar, Faculty Department of Periodontology for Securing first rank in examination conducted by Rajiv Gandhi University of Health Sciences Karnataka , Bangalore, August 2016. The management joins hands with Principal, faculties and students in extending very warm wishes. 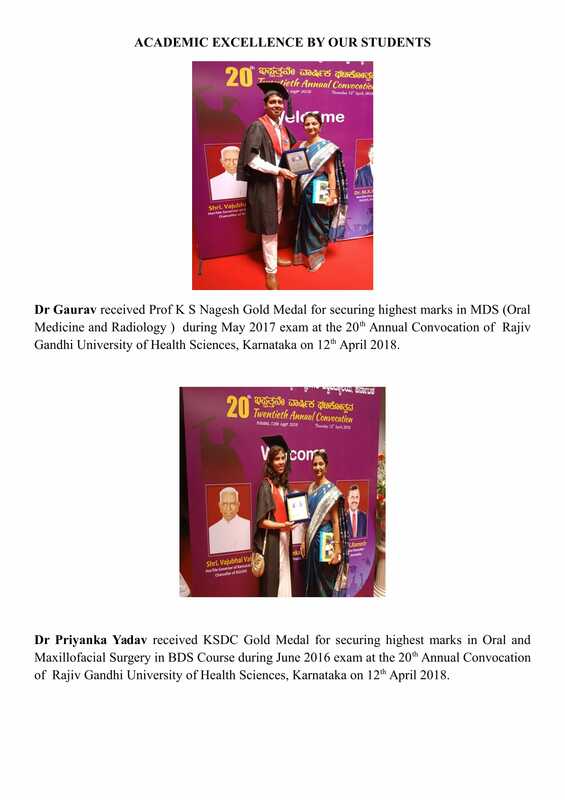 We feel happy and privileged to announce that our post graduate student Dr Pragyan Das from Department Of Oral Medicine And Radiology has secured 6th rank in the examinations conducted by Rajiv Gandhi University of Health Sciences Karnataka , Bangalore, August 2016. 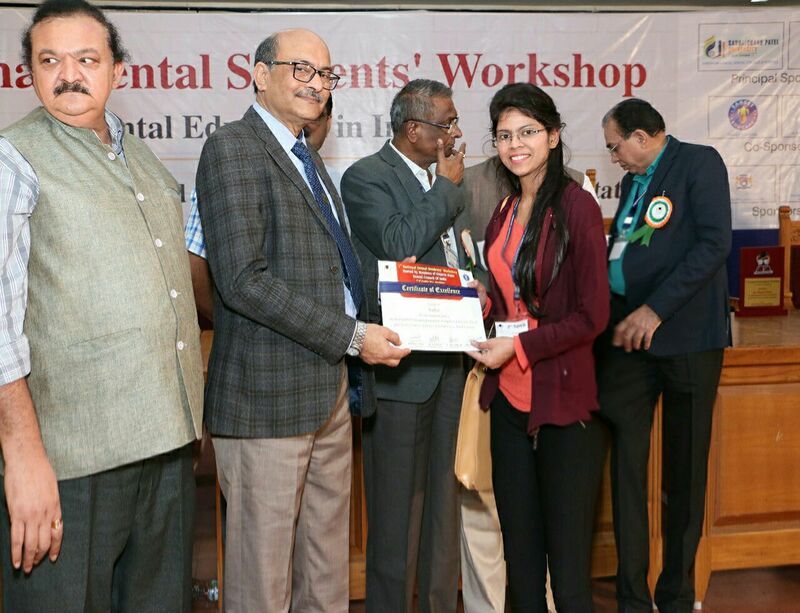 Miss Priyaka Yadav , was felicitated for securing first rank in 1V BDS Rajiv Gandhi University of Health Sciences Karnataka , Bangalore Examination during Academic year 2015 – 2016 at 1st National Dental Students Workshop On Dental Education In India 07/01/2017 and 08/01/2017, Sardar Vallabhai Patel Stadium , Ahmedabad , Gujarat.